Daniel Radcliffe is now a seasoned veteran of the Harry Potter films, having now played the wizard hero for five years in four films. But for a group of young actors, Harry Potter and the Goblet of Fire is their first taste of the movie-making business - and a big budget one at that. The Goblet of Fire introduces the characters of Cedric Diggory, Cho Chang and Victor Krum, all of whom have a big part to play in Harry's fourth year at Hogwarts. The actors were chosen following a massive casting search with Robert Pattinson picked to play Cedric, Katie Leung as Cho and Stansilav Ianevski as Victor. For Leung and Ianevski it was a case of a dream come true as they were selected ahead of other hopefuls despite having no acting experience. Leung queued for four-and-a-half hours at her first audition, spending just two minutes inside as casting directors selected girls purely on whether they had the right look for the part of Cho, who Harry develops a crush on. She was persuaded to head from her native Scotland to London for the audition by her father. "At the beginning I went for a bit of fun, I was really relaxed about the whole thing and just thought I was going to gain experience from it," said the 18-year-old. "Getting the part didn't really affect me in anyway until people started saying 'you beat 5,000 girls' and that's when I think 'yes, I did'." She added: "I didn't realise I could act before I went to the audition. It surprised me as much as anyone else." She admits she found it difficult on set at first but found Radcliffe a great help. "I felt really uncomfortable but Daniel's such a great actor and he told me to relax and I got used to it. His advice was don't let everything go to my head - just be level-headed." Emma Watson who plays Hermione also gave her some sound advice about the premiere. "She said make the most of it, it's your day. Just enjoy the experience," said Leung. 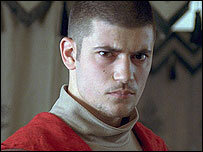 Ianevski, 20, was also plucked from obscurity to play Krum, the Bulgarian Quidditch hero of the Durmstrang Institute. Although educated in London, he fitted the Krum bill right down to his nationality and his love of keeping fit. There is acting in Ianevski's blood, his grandmother was a professional actress in black and white films in Bulgaria. "The Bulgarian film industry was very strong but the money has gone now since the fall of communism and not so many films are made there," said Ianevski. He insists the newcomers were made to feel welcome on the set by the Potter veterans. "I met Emma (Watson) first when Mike (Newell) introduced me to her when I went into the studio for the first time. "I felt as if I had known everyone for years even though I was entering something new. It was a really good family atmosphere." Although this was his first screen role he has his sights set high. "I have always followed Keanu Reeves, right from the beginning until he reached the top - I would like to do the same." But Ianevski was disappointed when he read the sixth Harry Potter book and found his character did not make a return to the action. For Robert Pattinson, 19, winning the role of Hogwarts' champion Cedric was not such a new experience, having already appeared in several films including the recent adaptation of Vanity Fair. Although he was not a Harry Potter aficionado he was thrilled to be involved in such a large project. "I hadn't read any of the books or seen the films so I can't say I was a fan. I knew of them, it's impossible not to know about them, " he said. "When I found out about the audition I read the book in about a day and knew I wanted to do it. "There's something very special about it. I think people will be watching the films for years, there's nothing else like it. 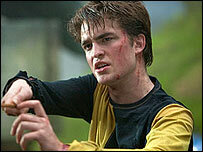 Pattinson started out as a backstage hand at a theatre company and originally had no interest in acting. But he was inspired by its production of Guys and Dolls and landed the lead part in the next production of Our Town. He admits that when he first arrived on set he was not exactly as fit as he should have been for the role of the athletic Cedric. "I hadn't done anything for about six months before so I was a little bit unfit. I remember the costume designer saying when I was trying on swimming trunks 'aren't you supposed to be fit, you could be playing a sissy poet or something'. "The next day I got a call from the assistant director about a personal training programme." Pattinson also will not be returning for the fifth movie but plans to continue his acting career on stage and screen.